What is it? Sasquatch? Bear? A person? How important are trail cams? They are having more and more impact in discovering elusive known animals and adding to the enigma of cryptids. One region of the world where trail cams routinely document rare creatures like tigers and rhinos is South Asia. Below is footage released May 29, 2008, of a female Javan rhino from Indonesia’s Ujung Kulon National Park, captured on video attacking a trail camera. No one knows why she decides to launch an assault on the cam, but wildlife experts say she apparently sensed that the lens was a threat to her calf. The rhino video, with sound, can also be seen here. The extremely rare large-antlered muntjak (Muntiacus vuquangensis) had never been captured on film before, and yet it (above) and unidentified poachers (below) were photographed in the Nakai-Nam Theun National Protected Area, Laos, by trail cams in 2007. The photo of this muntjak confirms its Laotian location, as it was first known only from skulls in Vietnam. 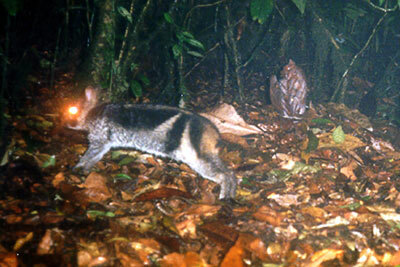 The Sumatran striped rabbit (Nesolagus netscheri) was also captured for the first time ever on a trail cam. The potential of trail cams is unheralded. Something could soon happen to either push that potential onward, into the next level, or completely muddy the waters. While only a hint of what’s behind it, with a “Coming Soon” sign denoting more details later, Bushnell Trail Cameras has posted a notice that you can “Win $1,000,000” from them by capturing “a verifiable photo of Sasquatch with your trail camera.” The mini-alert on their site shows two of the iconic “peas-in-a-pod” Bigfoot tracks (and thus unfortunately, examples of probable Ray Wallace fakes, I must acknowledge). …some trail cam photos can be extremely unique and weird, without even bringing cryptids into the picture, so to speak. Bushnell Corporation (also known as Bushnell and Bushnell Outdoor Products) is an American company specializing in optics and imaging. Its products include binoculars, spotting scopes, telescopes, night vision equipment, GPS devices, laser-guided rangefinders, riflescopes, holographic gun sights, and other high-end optical equipment. The company also sells Bollé ski goggles and sunglasses, H20Optix water sports sunglasses, and Serengeti all-purpose sunglasses. It was founded in 1948 by David P. Bushnell, during his time in Allied-occupied Japan. One of the best little trail cam models to use is Bushnell’s new camouflage Trail Scout Pro 5.0 night vision digital camera, which is designed to be mounted to a tree in the forest. It automatically snaps 5-megapixel digital photos of anything that crosses its path. It appears to be a trail cam in such demand, the price is actually gone up to over $360, even for used models. See here. The infamous “Pennsylvania Young Sasquatch” photographs of what was also called “Jacob’s Creature,” were taken with a trail cam. Specifically the camera used was none other than a Bushnell model. Even though the object of the trail cam (left) was probably a bear (right), it generated a lot of attention for the use of trail cams in the American woods. Below is a trail cam photo from Mt. Hood of a probable bear manipulating its body into a weird position (similar to the Jacob’s Creature? ), taken on June 7, 2007, at 7:11 p.m.
Cryptomundo is watching these developments closely, for investigations of past incidents have clearly shown sometimes real results are lacking. I’ll post an update as soon as I obtain more details on Bushnell’s Sasquatch trail cam photo contest. If my experience with being the consultant to the “One Million Dollar Prize” for a Bigfoot or similar cryptid photo, first floated in 2005, from Wizards of the Coast, is any indication, watch for a good deal of media attention to this one too. Bushnell is in for a stampede of interest and, perhaps, a bit of a revision of their full contest rules before we hear the final version unveiled. Still, indeed, we do live in interesting times. This entry was posted on Friday, May 30th, 2008 at 8:06 am and is filed under Bigfoot, Breaking News, Cryptomundo Exclusive, Cryptotourism, CryptoZoo News, Cryptozoologists, Cryptozoology, Evidence, Eyewitness Accounts, Media Appearances, New Species, Photos, Pop Culture, Public Forum, Sasquatch, Videos. You can follow responses via our RSS 2.0 feed. You can skip to the end and leave a response. Pinging is not allowed. Speaking again of: Where are the Sasquatch Snow Tracks? Wow, this definitely is indeed a very interesting new article about Bigfoot, to learn that someone is offering that much money for a trailcam photo of Bigfoot. Thanks, Loren, for this excellent overview of the topic, and for alerting us to Bushnell’s offer. I think trailcams can be a vital piece in the puzzle in the case of Sasquatch. Shame that interest is driving the price upward instead of making it cheaper (what one would expect) as the company begins producing more. If these were more affordable, groups and individuals could afford to “stock up” and literally blanket the countryside with these fantastic devices. I haven’t seen the official Bushnell rules and regulations concerning how they intend to verify photos of a suspected Bigfoot, but I’m sure their lawyers will make it almost impossible for someone to claim the prize. Can you imagine how many people will stage and hoax photos in an attempt to claim the prize? I’m all for remote camera deployments in remote areas in an attempt to capture these creatures on film, but so far, the typical game cameras don’t seem to be up to the task. Most of the pictures on the Bushnell web site and other similar sites show animals looking directly into the camera. This means the animals have already sensed the camera and are looking directly at it when the picture was taken. Because of past experience with remote cameras, I have identified a number of factors that may contribute to the way animals perceive these cameras. I have demonstrated some of these findings at Eric Altman’s and Don Keating’s conferences. After years of testing theories and different technologies, I have finally produced a camera system that addresses the numerous problems of today’s game cameras. The new system is called the EyeGotcha Digital Video/Audio surveillance system and will be in production very soon. One of the working units was displayed at Don’s Ohio conference a couple weeks ago and interest in the camera system was great because it was designed as a modular system that will fit every Bigfoot researcher’s budget. I have been working with camera systems for about 18 years and even I’m impressed how unique the EyeGotcha system is. The official launch for the EyeGotcha camera systems will take place at Eric Altman’s conference in September. Researchers, especially new ones, must remember that the any of the game camera type systems are just another research tool that can be used to gather evidence of the creature’s existence, the photos themselves will not provide definitive proof these creatures exist. I envision placing game camera type systems in areas suspected of Bigfoot activity, if successful, the image or video along with the time/date information will provide much needed data which could be used for future research. To Mr. Dranginis’ point, the controversy surrounding all potential photos may indeed be an out for Bushnell to never have to pay the bounty. Quite a clever marketing tool! I’m guessing its not exactly legal to just buy a trail cam and pick a random tree in the forest. Wouldn’t that kind of be vandalism as the tree isn’t on your property? This could actually be a good idea, but $360??? They should offer a discount to the contestants. And also a possible cut in the royalties. It would only be fair since an actual bonafide Sasquatch photo would be worth A LOT MORE to news channels all over the world. I’ve been monitoring Bill’s progress over the last couple of years and will try his new equipment when he puts it out. If anyone can produce a mass production camera to record a Bigfoot it will be Bill Draniginis. There are ways to examine a digital file to see if it’s been altered. Bushnell is a solid name and I think they’ll pay if the pic is legit. It’s going to have to be a good photo for sure. Not sure what to think…but the marketing angle is very clever. This article might hold some important clues about the future of bigfootry. Trail cams and Google Earth might replace traditional bigfootry, or the process of going deep into the woods to look for bigfoot. Google Earth hobbyists will spot strange structures in clearings of remote forested areas like the “birthing complexes” of Tennessee (anyone else heard of that term?) Then teams will go to those areas and install trail cams. More information might come from such a setup than from 10 years of traditional bigfootry. i will let them keep their money if they donate 75 of their newest camera traps to use. just think bushnell your camera trap the only one to catch bigfoot and you keep the money and all you did was donate the cameras. i will freely do any ad campaign saying only a bushnell could catch bigfoot. all for the small price of 75 donated camera traps. I think that for 500,000 dollars, a number of people, especially in Hollywood, could do a -very- good hoax, and make 500,000 dollars off of it. I could see that for a carcass, but that doesn’t seem wise for just a trailcam photo. Yep, you, Jane Goodall as referees, (in exchange for some research funds) would give this a higher profile, be good advertising for Bushnell. That top picture is super strange. That is exactly how I would imagine sasquatch hair, long and straggly. Most game cams have the option to take more than one picture with 5 10 30 second delays, etc. So what I’m wondering is where are the rest of the pics. It looks like whatever it was walked right in front of the cam, but then where did it go. Weird. AlbertaSasquatch, I don’t know if that’s actually long hair. I think it might be ‘camera blur’. If we could post pics here I could show you some ‘long haired’ deer. I also have a great pic of a Sasquatch foot. At least that’s what I thought it was till I lightened up the picture. These game cams have a lot of flaws. Wow! What perfectly conditioned, nicely unmatted straight luxurious hair. Did bigfoot just come from the salon? Please. I have long hair, and after a few days in the woods, without a comb, it would look pretty ratty. This hair is beautifully combed, conditioned, with all the split ends trimmed. lol, come on! 1. Many reports describe EXTREMELY unkempt hair, which indeed makes that look salon-produced. 2. At least one report – of a visible sasquatch conducting an intimidation display at VERY close range (they usually aren’t visible when they do this) – actually uses the word “pretty” to describe the animal’s hair. 3. The Irish Setter is frequently referred to in reports as a reference point to help describe the hair observed on the subject. Anyone owning an Irish Setter knows you can’t afford to let THAT hair get away from you. 4. They’re primates (from all the evidence). Primates groom each other regularly. NOT saying what that is (although it looks, emphatically, like hair to me and emphatically NOT like camera blur). And before the eye-rollers start coming out of the woodwork, I should clear up something I said in the last post above. My statement about visible/invisible intimidating sas should not be interpreted to mean they orb out or go fourth-dimensional. It simply means that they stay behind vegetative cover when trying to intimidate humans – with the rare (“pretty”) exception. We’re waiting for a substantive contribution to this discussion from you. Which would be: a systematic debunking, showing how every single encounter report – or even enough of them to put the rest in some doubt – adds up to a false positive. The case that they don’t – that there’s something here that science needs to explain – is virtually airtight. And I’ve made it, many times, on this site. So have some folks with, I’ll wager, far more chops in relevant fields than either of us have. Some, however, just can’t be bothered, I guess. Or need to smarten up. As I’ve said: I’ve had it, to here, with naive, gullible, uninformed “skeptics.” Is Ben Radford spreading spores or something?